Yesterday was part 1 of our Countdown to Harry Potter, and as part of our week-long celebration leading up to the next Harry Potter movie (November 19, 2010 – The Deathly Hallows), we present the next Harry Potter-related bit of LEGO news and information. TT Games (Traveller’s Tales – official website) and Warner Brothers announced yesterday that LEGO Harry Potter: Years 1-4, will soon be available for Apple’s iPhone, iPad, and iPod touch. Hopefully it will be available ahead of next week’s release of the seventh Harry Potter movie. The official site is not live, but you can still check out the official WB LEGO Harry Potter site as well as the TT Games LEGO Harry Potter site. 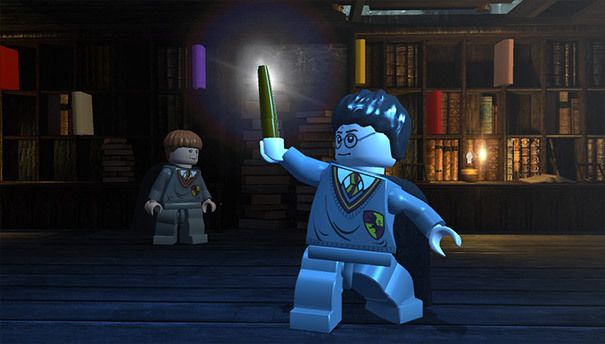 The LEGO Harry Potter games are obviously set in the Harry Potter universe, and follow the students through the first four years. The focus is on collecting items and exploring various areas in the Harry Potter universe. I’m sure this will be scaled way down from the full console and Windows versions in regards to the areas to explore, but from the screenshots, Hogwarts will still play an integral part. Hopefully Hogsmeade will still come into play. Getting away from the Harry Potter aspect for just a moment and focusing on the LEGO aspect, hopefully this will do well enough to encourage TT Games to port some of the other LEGO video games to Apple’s iOS/iPhone OS platform. I think a true-touch interface could lend itself to some of the games if done properly. TT Games being owned by Warner Brothers obviously has a lot to do with LEGO Harry Potter coming out first, but TT Games handles LEGO Indiana Jones, Rock Band, Batman, and Star Wars, along with LEGO Battles. As soon as it’s available, I’ll be downloading it and posting a review. Unfortunately there is not a lot of information right now.